Cuba’s international relations have undergone significant shifts in recent years, with old alliances unraveling and new partnerships emerging. In particular, the Cuban government of Fidel Castro has embarked on a path of deeper engagement and cooperation with Venezuela and China that has transformed those two countries into the most important international allies of Cuba today. Since 2001, the rising influence of Venezuela and China constitute the most significant realignment of Cuba’s foreign relations since the collapse of the Soviet Union in the early 1990s. This is all the more striking because it has occurred against the backdrop of modest U.S. efforts to tighten existing sanctions and hasten change in Cuba. Without question, the emergence of Venezuela’s Hugo Chavez has provoked the most dramatic change in Cuba’s international relations in this hemisphere. Elected to the helm of the most significant oil-producing country in Latin America in the late 1990s, Chavez has steadily proceeded down a path of closer political and economic ties with Cuba. After his temporary removal by force in April 2002, Chavez has become increasingly reliant on the advice and counsel of Fidel Castro to help maintain his power in Venezuela. At the same time, Chavez has offered hundreds of thousands of barrels of discounted oil to the Cuban government, which has helped the island to keep its rickety economy afloat despite tougher U.S. measures. The scope and nature of the Venezuela-Cuba relationship has also sparked concerns that the two governments may seek to advance proposals that run counter to the strengthening of market-oriented democracy in the region. A second major shift in Cuba’s international profile is its deepening ties with the People’s Republic of China, a country of 1.3 billion people that has achieved sustained growth through introducing market reform into its communist political system. China has prioritized Cuba as a key partner in Latin America, and quickly surged to become the island’s third largest trading partner after Venezuela and Spain. China’s interest in Cuba has led to frequent high-level meetings, a series of economic cooperation agreements, and growing exchanges in the areas of science, technology, and defense. China plans to invest millions in Cuba to help secure needed commodities such as nickel and agricultural products, and it has been a strong supporter of Cuban positions in international forums such as the United Nations. The emergence of China as an economic power has strongly benefited the Cuban economy and become a crucial component of the island’s economic planning. Cuba’s strong ties with Venezuela and China contrast sharply with its deteriorating relations with other partners. While the European Union remains an important economic player, Cuba’s dissident crackdown in 2003 and subsequent hostile rhetoric have cooled relations considerably, despite moves by Spain to help improve ties. In Latin America, Cuba has experienced a partial renaissance as a large swathe of South American countries have elected center-left leaders, including Argentina, Brazil, Paraguay, and Uruguay. While most countries have been hesitant to deepen ties with Cuba, almost all have at least established normal diplomatic relations and several have stepped up their trade and investment with the island. Meanwhile, Cuba’s once staunch alliance with Mexico has verged on total breakdown during the administration of President Vicente Fox, mainly because the Mexican government has backed successive UN resolutions condemning the human rights situation in Cuba. Of all the world’s major capitals, only in Beijing and Caracas are Cuba’s claims as a defender of the interests of the third world so attentively received, and only China and Venezuela are attempting to harness Cuba as a vehicle for pursuing their own national interests and international objectives. Recent evidence suggests that any contemplation of Cuba’s present or future must extend to include the scope and implications of the island’s deepening links with Venezuela and China. Perhaps no other bilateral relationship within Latin America has prompted as much speculation and concern as the bond between Castro and Venezuela’s Hugo Chavez. Chavez, a former army paratrooper and fiery populist, won the presidency in 1998 with overwhelming support stemming from his indictment of Venezuela’s corrupt political classes. Chavez first struck up a friendship with Castro in 1995, when he was received in Havana with a hero’s welcome following his release from prison for a 1992 coup attempt. As a presidential candidate, Chavez promoted the concept of “Bolivarian Revolution,” a mix of economic populism and support for social programs, couched in leftist terminology. Chavez traveled to Cuba as president-elect in early 1999, sealing a very public friendship with Castro that soon emerged as a political flashpoint in Venezuela’s increasingly polarized electorate. In October 2000, Chavez and Castro signed the socalled Convenio Integral de Cooperación that has formed the backbone of the “oil for services” arrangement that is economically crucial to Cuba and politically inflammatory in Venezuela. Under this agreement, Cuba would receive 53,000 barrels of oil a day at favorable rate of financing, in exchange for providing technical support and advice in areas of education, health care, sports, and scientific research. The oil shipments from Venezuela represent about onethird of the island’s energy consumption, with an estimated value of $400 million—or one-sixth of total imports—making Venezuela Cuba’s largest trading partner. Yet for the state-owned oil company Petróleos de Venezuela (PDVSA), Cuba’s oil imports are barely significant, representing less than 2 percent of annual production. During the aborted military coup that ousted Chavez in April 2002, top PDVSA managers immediately suspended the oil shipments to Cuba, on the basis that the island had failed to make payments. Chavez, temporarily chastened by his brief removal from office and economic troubles marked by an $8 billion budget deficit, allowed the suspension to persist until August of that year, when the oil agreement was renewed. Chavez’s open and unapologetic embrace of Fidel Castro has infuriated Venezuela’s conservative sectors and conjured up the specter of “Cubanization” of Venezuela. Cuba’s deployment of thousands of teachers, doctors, and sports trainers in Venezuela has sparked considerable intrigue, and the agreement has generated controversy in both countries. Venezuelan educational and medical groups have expressed skepticism about the need to import foreigners, while the political opposition has seized on the Cuban arrangement as evidence of Castro’s meddling in the country’s internal affairs. In Cuba, some worry that the departure of valued professionals for oil-rich Venezuela will lead to a further decline in a social safety net deprived of resources and largely dependent on human capital, and there is concern about becoming overly reliant on Chavez’s potentially precarious hold on power. During a two-day meeting in April 2005, Cuba and Venezuela signed an agreement to increase the number of healthcare workers to 30,000 and implement ambitious health programs, including the establishment of 1,000 free medical centers, training for 50,000 medical personnel, and surgical treatment for up to 100,000 Venezuelans in Cuba.4 Meanwhile, Venezuela has increased oil shipments to Cuba to 90,000 barrels per day. Allegations that the Cuban specialists are spies or sources of communist indoctrination have become a staple of Venezuelan politics. While there is evidence that shared intelligence and defense training between the two countries has increased, the majority of the doctors and educators are more likely to be exactly what they appear: Cuban professionals anxious to escape the island’s scarcity for a chance to earn a little more money. More worrisome, from the U.S. perspective, is that by providing needed services in Venezuela’s poorest barrios, the Cubans are bolstering political support for Chavez among the disenfranchised who have otherwise seen few promised results from his “Bolivarian revolution.” Paradoxically, then, Castro has played a crucial role in Chavez’s efforts to maintain his domestic popularity. While this alliance clearly has intentions of influencing regional affairs, its impact thus far has been limited. There is no question that Venezuela’s oil is crucial to Cuba, and that Chavez derives some political benefit from Castro’s support. Yet Chavez owes his rise to domestic political factors that are entirely independent of Cuba, and the loss of Venezuelan oil shipments would be a significant but manageable setback for Castro. Cuba’s nearly $2 billion in annual tourist revenues and hundreds of millions of dollars in remittances from the U.S. both serve a more important economic role, and the island has made significant strides in developing oil sources for domestic energy consumption. Venezuela has scored scant victories in hemispheric institutions. The U.S.-backed Colombian ambassador Luis Alberto Moreno handily won the recent election as the head of the Inter-American Development Bank, while the Venezuelan candidate, former finance minister José Rojas, barely got off the ground. Venezuela proved more influential during the election for the new Secretary General of the Organization of American States, by strongly supporting the eventual victor, Chile’s José Miguel Insulza. That election represented the first time in the organization’s history that the U.S. has failed to secure victory for its preferred candidate, although Insulza is a respected democratic politician who later publicly assured that “elected governments that do not govern democratically should be held accountable by the OAS”—a tacit acknowledgment of U.S. concerns about Venezuela. In a public opinion survey released in July 2005, the Caracas-based polling company Datanálisis showed that 11.6 percent of respondents approved of using the Cuban system as a model for Venezuela, while 63.2 percent were opposed. While only a fraction of Venezuelans have professed to favor the Cuban model, this poll reflects that the sentiment has grown markedly over the past three years. In an earlier poll conducted by this company in July 2002, merely 3 percent expressed support for Cuba while 91 percent were opposed. In January 2005, Venezuelans’ preference for the Cuban model registered at only 6 percent, indicating that most of the growth in sentiment has occurred in the last six months. Worryingly, this period has been characterized by Chavez’s public support for a “new socialism,” dramatic denouncements of supposed “U.S. plots” to assassinate Chavez, and continued political repression in Venezuela. A separate nationwide poll, carried out by the firm Sejias & Asociados in late May and early June 2005, revealed that 48 percent of respondents preferred a socialist system over a capitalist system, with less than 26 percent preferring capitalism.9 While most hemispheric leaders maintain relations with both countries, they have steered clear of entangling alliances and instead focused mainly on regional integration and managing relations with the United States. The leaders of Venezuela and Cuba have a penchant for grand rhetoric describing a hemisphere united against American hegemony, but thus far they remain a two-man club. Nevertheless, there is a possibility that the pendulum may swing further in their direction in 2006 brings electoral victories for Evo Morales in Bolivia, Daniel Ortega in Nicaragua, or other leftist leaders. Cuba is a longstanding ally of China. On September 1, 1960, Fidel Castro announced the severing of diplomatic ties with Taiwan in favor of a relationship with China, and the two countries established diplomatic relations on September 28, 1960. Cuba was the first Latin American country to recognize China, and the two countries maintained generally cordial relations from the 1960s to the 1980s, despite periodic tensions caused by Cuba’s near total embrace of the rival Soviet Union. In December 1984, China dispatched resident military attaches to Cuba, initiating what has become a series of friendly military contacts. In November 1988, China and Cuba ceased to require passport visas for travel by their citizens between the two countries. Cuba’s trade with China topped $600 million dollars in 1990, but subsequently declined to less than $270 million by 1995, due to the collapse of Cuba’s sugar industry.10 In February 1995, China and Cuba signed an Agreement on Cultural, Educational, Scientific and Technical Cooperation, paving the way for frequent cultural and sports exchanges. The first joint venture between the two countries was a plant for manufacturing plastic slippers that was established in Cuba in July 1997, with Chinese investment of $2.12 million. The enterprise produced 4 million plastic slippers annually and other cooperative ventures ensued. The China-Cuba Joint Commission on Economic and Trade Cooperation has met more than a dozen times at the ministerial level. China and Cuba are economically complementary. China imports sugar, nickel, and medicines from Cuba, while exporting rice, kidney beans, and electrical, industrial, and textile products. In 2002, trade turnover between the two countries reached $430 million, which included China’s exports of $310 million and imports of $120 million.14 The following year, China added Cuba to its list of official tourism destinations. At the China International Fair for Investment and Cooperation held in the port city of Xiamen in September 2004, the delegation from Cuba’s Ministry of Foreign Investment and Cooperation presented 41 proposals for joint ventures with Chinese enterprises, in sectors including medical equipment, sugar products, fishing, furniture, and footwear and garments.15 At that time, the two countries already boasted 10 joint ventures in operation, including six in Cuba and four in China, in addition to three cooperative production contracts. The joint ventures in China focused on pharmaceuticals, advanced medical devices, biotechnology, and genetic engineering.16 With the help of Chinese investment, Cuba is due to double its nickel and cobalt production over the next four years. In November 2004, Chinese President Hu Jintao led a delegation of trade leaders to Cuba for extensive meetings with Fidel Castro and top members of his government. Hu arranged the stop over in Cuba on his return from the Asia Pacific Economic Cooperation (APEC) summit in Santiago, Chile. Significantly, Cuba was one of only three other countries in addition to Chile that Hu chose to visit during his first trip to Latin America, the others being Argentina and Brazil. China’s imports from Cuba have expanded to include nickel, biotechnology products, fresh and processed citrus fruits, steel, and tobacco. During this visit, Hu and Castro signed 16 agreements for cooperation in the areas of nickel and mineral processing and exploration. The accords call for Cuba to provide 4,400 tons of nickel annually to China. In addition, China will invest $500 million in a new Cuban nickel plant in Moa, Holguín province. China granted the Cuban government a 10-year extension to repay four interest-free loans that Beijing had provided during the island’s severe economic crisis from 1990 to 1994. China agreed to provide a $6 million grant to Cuban hospitals, and materials for school uniforms valued at an additional $6 million. China offered to ship 1 million television sets to Cuba. Indeed, Chinese “Panda” television sets have become synonymous with rewards from the Cuban government for strong support for the Communist Party, due to the fact that citizens appointed to head the neighborhood-watch groups known as the Committees for the Defense of the Revolution often received Panda televisions for their services. Cuba has also strongly backed China’s goals of eventually reclaiming its “renegade province” of Taiwan under the “One China” policy. During a visit to Beijing in March 2005, Cuba’s Minister of Government Ricardo Cabrisas Ruiz vowed continued support for China’s Anti-Secession Law, approved by China’s National People’s Congress.19 In return, China has been a forceful opponent of U.S. sanctions on Cuba at the United Nations and other international bodies. In October 2004, China’s deputy representative to the UN, Zhang Yishan, criticized the U.S. for its decision to maintain the embargo and therefore “obstinately stick to the wrong position and ignore the just demand of the international community.” In April 2005, China vocally expressed its longstanding opposition to U.S.-led efforts to condemn Cuba for its repression of civil and political liberties. As China’s political and economic clout continues to grow, Cuba is poised to become Beijing’s most valued beachhead in the Caribbean. The burgeoning Cuba-China relationship has occurred in the context of China’s efforts to pursue closer ties with Latin America as a whole, including Venezuela. Hugo Chavez made his first state visit to China in October 1999, where he met with Chinese president Jiang Zemin, Premier Zhu Rhonji, and other leaders. His trip marked the first Venezuelan presidential visit to China since 1983, and Chavez brought 24 economic projects seeking cooperation with the Chinese. In 1999, Venezuela was already the largest single recipient of Chinese investment in Latin America, mainly concentrated in two Venezuelan oil fields under development by the China National Petroleum Corporation. In April 2001, Chinese president Jiang Zemin visited Venezuela during his six-country swing through Latin America intended to advance trade initiatives and drum up opposition to a measure to censure China’s human rights practices at the United Nations. In Chavez, he found a willing ally, who proclaimed his admiration for Mao, backed China’s effort to host the 2008 Olympics, and most importantly, pledged to oppose the UN resolution. During the visit, Chavez declared that “we don’t believe any country in the world has the right to condemn another … We are going to vote against the resolution.”20 Chavez also announced that he would write a letter of condolence to the family of a Chinese fighter pilot who died in a collision with a U.S. spy plane earlier that month. The agreements signed during the trip included a $60 million investment in a tractor factory and a number of accords on energy, mining, agriculture, and taxation. Chavez also said that the two countries discussed the joint manufacturing of Chinese K-8 and Y-12 military training and cargo planes in Venezuela. In 2001, Venezuela’s trade with China totaled $350 million while Chinese investment in Venezuela totaled $530 million in 2000.21 By 2000, trade between China and Venezuela had already hit $351 million, which represented an 86 percent increase over the prior year.22 In May 2001, Chavez visited Beijing for a second time for a five day visit, where Jiang remarked that China had “a positive attitude towards formulating a ten-year plan of cooperation between the two countries.”23 During this trip, Chavez presented Jiang with Venezuela’s top honor, the Liberator’s medal. A deal was struck for China to buy Venezuelan oil and provide a crucial loan for Venezuela’s farming sector. Venezuela and China have also signed a Strategic Energy Plan that extends until 2011, which lays out provisions for Venezuela to increase oil exports to China while boosting its own agricultural production. China already operates two oil fields in Venezuela, the Intercampo Norte and Caracola blocks. In December 2004, Hugo Chavez made his third visit to China, signing oil and gas deals that allowed Chinese companies to invest $350 million in 15 oil fields located in eastern Venezuela, as well as an additional $60 million investment in natural gas projects. Chavez also planned to buy a satellite from China, and Information Minister Andrés Izarra later said that the satellite would be placed into orbit within a year, thereby giving the country “full sovereignty in its telecommunications.”25 Venezuela also sought to acquire Chinese radar to improve security along its border with Colombia, and there are signs that security cooperation will continue. While it is premature to speak of a China-Cuba-Venezuela axis in the Western Hemisphere, there is little question that all three countries are seeking to strengthen bilateral ties with each other to advance complementary political and economic interests. During a speech in February 2005, Fidel Castro declared that Cuba was “rising again like a phoenix” due to its economic ties with China and Venezuela.26 While the island’s economy remains in the doldrums, it is true that Cuba’s economic strategy of forging ties with China and Venezuela has reaped important dividends. Subsidized Venezuelan oil has not prevented recurring blackouts in Cuba, but it has surely alleviated some of the island’s economic deprivation. China’s large investments in the mining sector and growing interest in tourism and agriculture also provide Cuba a needed boost. However, perhaps the most intriguing aspect of these new alliances concerns the potential impact on Cuba’s eventual transition process once the 78-year old Fidel Castro eventually leaves the stage. For many years, the United States has positioned itself as the unrivalled actor in shaping Cuba’s post-Castro politics. While other countries—especially Canada, Spain, and the broader European Union— conducted normal business in Cuba, they similarly favored the island’s evolution towards a market-oriented democracy. Latin American countries, for their part, have generally distanced themselves from the Cuban system in pursuit of economic modernization and more democratic politics. Once the Soviet Union collapsed in 1991, Cuba found itself with trading partners but no true allies who had an interest in perpetuating the Cuban system. In just a short period of time, this has changed. Cuba now has two important allies with a stake in the existing system and an interest in maintaining the island’s current political order. In Venezuela’s Hugo Chavez, Castro has discovered an important partner with substantial resources. Venezuela has begun to experiment with its ability to consolidate ties with the Caribbean countries to create a block of votes at the Organization of American States, and it may find new ways to exercise power in the inter-American system. If so, Venezuela could represent a counterbalance to U.S. actions that may have some ability to influence other countries in the hemisphere. However, Venezuela’s outreach to Cuba reflects a narrow decision taken by Chavez and his leadership group. As such, any leadership change in Caracas would likely result in rolling back or even breaking off this alliance. By contrast, the Chinese involvement in Cuba represents a consensus decision by a ruling party that is seeking to advance its main interests in the Western Hemisphere: securing natural resources to feed a rapidly growing economy and stripping Taiwan of its remaining diplomatic allies in the Caribbean and Central America. Moreover, China has a crucial veto on the UN Security Council that could potentially represent a counterweight to U.S. efforts in pursuit of its objectives in Cuba. While the Cuban leadership appears to believe that China’s friendship is based on socialist solidarity, this is probably incorrect. China is primarily seeking a return on its investment, and if Cuba fails to deliver economic results then the relationship will cool. In any case, the United States today remains far and away the most important actor in shaping an international response to post-Castro Cuba. Still, U.S. policymakers who dream of remaking Cuba should be aware that China and Venezuela are poised to loom ever larger in Washington’s rearview mirror. 1. Alexei Barrionuevo and Jose de Cordoba, “For aging Castro, Chavez emerges as vital crutch,” The Wall Street Journal, on-line edition, February 2, 2004. 2. “Some of Cuba’s doctors work in Venezuela,” Associated Press, July 13, 2005. 4. 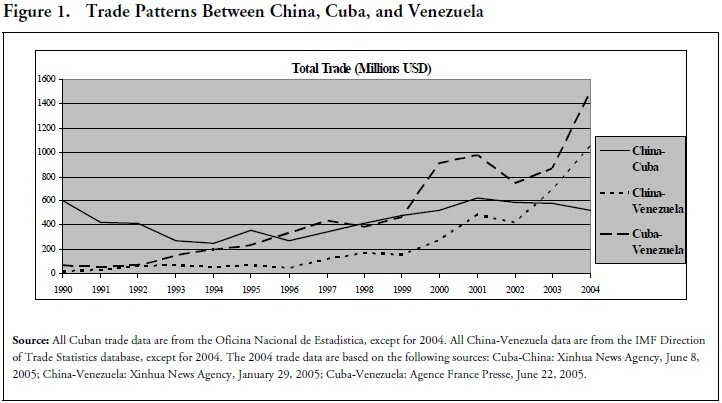 “Cuba economy: Trade with Venezuela set to expand,” EIU ViewsWire, May 27, 2005. 5. Barrionuevo and de Cordoba, February 2, 2004. 6. George Gedda, “Castro-Chavez ties worry U.S.,” Associated Press, January 6, 2004. 7. “A political awakening,” The Economist, February 21, 2004. 8. “Using oil to spread revolution,” The Economist, July 28, 2005. 9. The polling figures in this paragraph come from an article by Phil Gunson, “Cuban system gains support in Venezuela,” The Miami Herald, July 22, 2005. Other interesting data from the Datanálisis survey include that almost half of Venezuelans do not believe that Chavez intends to create “a second Cuba,” while 37 percent believe this is his goal. 10. Patricia Grogg, “Cuba-China: trade ties growing despite differences in ideology,” Inter-Press Service, September 8, 2004. 11. “China grants Cuba almost 400 million dollars worth of loans,” BBC Monitoring, April 14, 2001. 12. Elisabeth Rosenthal, “China’s Sparkle Bedazzles a Visiting Castro,” New York Times, February 28, 2003. 13. Rosenthal, New York Times, February 28, 2003. 14. China’s Foreign Ministry website. 15. Patricia Grogg, “Cuba-China: trade ties growing despite differences in ideology,” Inter-Press Service, September 8, 2004. 16. Grogg, Inter-Press Service, September 8, 2004. 17. Andrea Rodriguez, “China forges stronger trade relations with Cuba,” Associated Press, November 23, 2004. 18. Rodriguez, Associated Press, November 23, 2004. 19. “Cuba backs China’s anti-secession law,” BBC Monitoring, March 18, 2005. 20. Alexandra Olson, “Jiang Visits Venezuela, winning support against human rights resolution,” Associated Press, April 16, 2001. 21. Olson, Associated Press, April 16, 2001. 22. “Venezuela’s Chavez calls for more economic ties with China,” Agence France Presse, May 27, 2001. 23. Agence France Presse, May 24, 2001. 24. Summarized from Joshua Cooper Ramo, The Beijing Consensus (London: The Foreign Policy Centre, Spring 2004) and “Venezuela: China Cooperation,” Oxford Analytica, November 12, 2004. 25. Venezuela’s Chavez predicts $3 billion in trade with China next year,” Associated Press, December 27, 2004. 26. “Cuba,” Oxford Analytica, February 14, 2005.